The NCAA Tournament is so quick that any momentum can carry a team in and through each weekend. For some, this momentum comes from a big win in their conference, and for others, a run in their respective conference tournament can kickstart it. For the Michigan Wolverines, the momentum has just begun. After a big win over Ohio State two weeks ago, the momentum has turned into a 9-game win streak for the Wolverines and a Big Ten tournament Championship. With back-to-back wins over Michigan State and Purdue, the sky is the limit for this young team. Michigan’s resume continues to build. The win over Purdue is their seventh Quadrant-1 win, and they haven’t seen a loss since February 6th. With the recent success, this could mean a Final Four is brewing. Now that the Big Ten tournament is finished, the Wolverines must wait over a week before they play a game. Michigan’s success in this tournament, and the championship specifically, happened due to their spacing and ball movement. Constantly putting Purdue big Isaac Haas in ball-screen actions and keeping shooters wide and in the corners, Purdue had no answer. What makes them so dynamic is that they can choose which area to exploit. 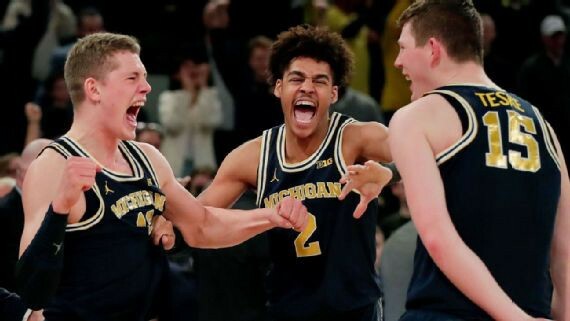 If they want to get a roller and a threat at the rim, they’ll run pick and roll with Jon Teske, but they can also get pick and pop actions with Moritz Wagner. It creates mismatches and gives them more to work with when they meet the unexpected in the tournament. This team plays with poise and attacks the moment rather than sits by while the moment passes. With just over a week before the madness begins, Michigan has punched their ticket in.